News of More Aberrant Maroon Clownfish in PNG, From PNG! A couple weeks ago Lorel Dandava-Oli posted a very interesting comment on The Lightning Project’s website. Dandava happens to be a Marine Aquarium Fisheries Officer-National Fisheries Authority in PNG. Her husband, Darren Oli, is the proprietor of Paradise Aquariums, established in 2012, which is perhaps best described as a service company which provides aquarium installation and maintenance for commercial clients, mainly businesses and hotels in the area. Of course, I had to clamor and beg for images. Dandava went through a lot of hassle to get us two cell phone images (no small feat coming out of PNG) and I’ve done my best to clean ‘em up and sharpen them so you can see the interesting wild White Stripes that are swimming in Dandava’s tank. After reviewing the images, this was my response to Lorel Dandava. 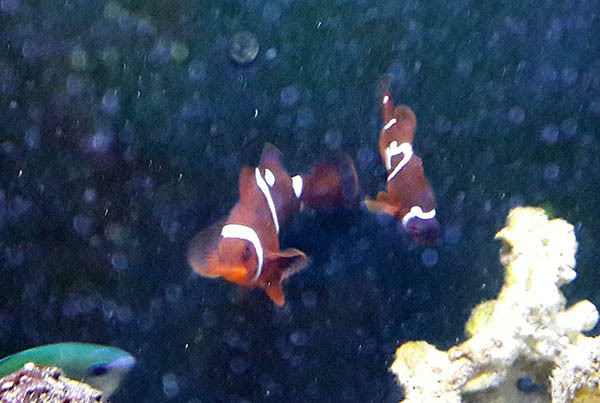 “The pair you have looks like a pairing of a traditional, default “wild type” 3-striped White Stripe Maroon Clownfish, typical for PNG. The 2nd fish appears to be what some have called a “Lightning Precursor”..in my opinion this is probably one of the more intricate examples of the form that we’re currently calling “Morse Code” ( a mixture of dots and dashes) which are somewhat routinely found in PNG waters. While we have seen some of these fish that at first glance look like they could have something “lightning” floating around in their genes, I think that’s a bit of wishful thinking. Sadly, I think I can report that you probably won’t see any Lightning type offspring from this pair. The main reason I come to this conclusion is that Soren Hansen of Sea & Reef Aquaculture is breeding with similar wild-collected PNG “Morse Code” Maroons, and he does not get any Lightning progeny from that pairing. He does, however, get more of the spotted and striped “Morse Code” phenotype. I don’t know whether he has one, or two, Morse Codes paired together. I don’t think Morse Code is directly related [to Lightning] – if it was, then I would have presumably seen either a) nothing but Morse Codes in the F1 generation, or b) all the non-lightning offspring I reared would have been morse codes. Neither happened. Of course, it bears repeating that most all of these thoughts is a hunch…none of us have done enough test matings, and collected enough data, to answer these genetic questions with certainty. 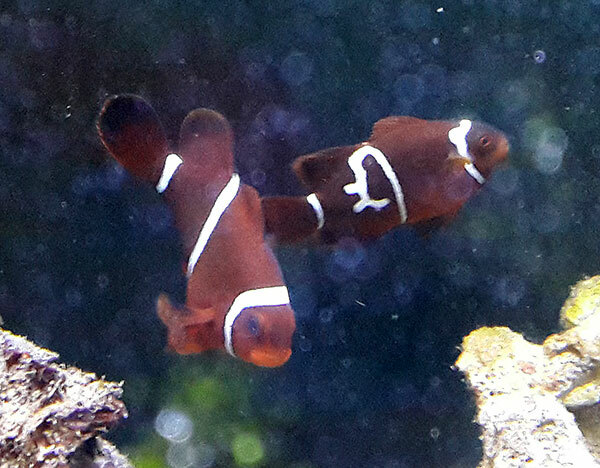 Meanwhile, we can say with some reasonable certainty that Dandava’s pair should produce a lot of interesting Morse-Code type maroons, and that in itself is of interest as we continue to unravel the genetic mysteries of PNG’s unique white stripe Maroon Clownfish. Written by Brandon Mehlhoff about 5 years ago. I REALLY like that male!